Ultra-compact, budget-priced 2-way monitor speakers. When it's time to replace those cheap "computer" speakers with serious 2-way professional studio monitors, you're ready for the Eris E4.5. With Kevlar low frequency transducers, low-mass silk-dome tweeters, responsive Class AB amplification, and professional acoustic-adjustment controls, the compact Eris E5 represents an outstanding value in its class. It includes RF shielding, current-output limiting, over-temperature protection, and subsonic protection, and unlike comparably priced studio monitors, it has controls for simulating different listening environments and flattening frequency response to enable accurate mixing. 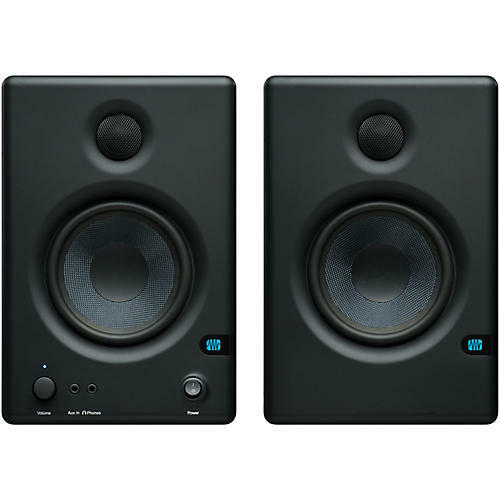 The perfect monitors for small room studios. Order a pair today!